Williams becomes the first woman to serve as Director of Athletics at Alabama State. 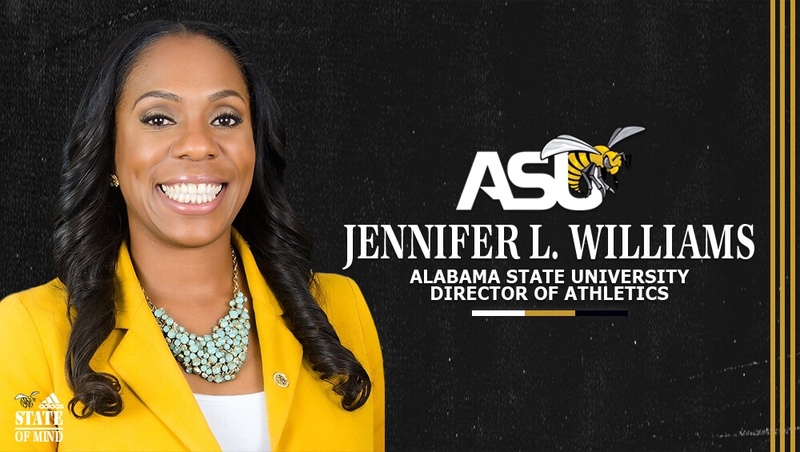 MONTGOMERY, Ala. | Alabama State University President, Dr. Quinton T. Ross, Jr. removed the interim tag from Jennifer Lynne Williams, announcing her as the new Director of Athletics at Alabama State University Wednesday afternoon. Williams took over the helm of the department in October 2017 and helped celebrate the fifth consecutive Commissioner’s Cup Award for the department in May, while also celebrating the eight conference championships won during the 2017-18 academic year. The Hornets also claimed four regular season championships, with three other teams finishing as conference runner-up in their respective sport. Alabama State had 37 student-athletes recognized as all-conference, won multiple coach of the year awards and had a Google Cloud Academic All-America selection this season under her guidance. Not only did Alabama State shine on the field, but they also did in the classroom as well as every team reached the threshold to be eligible for postseason play according to the NCAA APR results. Two of the teams scored a perfect 1000 – women’s cross country and bowling – and three others scored 990 or better.